If you payed close attention to the announcements coming out of Computex 2014 you’ll recall that Intel announced the Core M processor series. The Intel Core M processors are based on the 14nm Broadwell micro-architecture and will be the most power-efficient processors offered by Intel in this generation. Before the Computex announcement these processors were previously known under the code-named Broadwell-Y. The Intel Core M series have been designed to fill the gap between the Atom series and full fledged Core series that are a bit too powerful and power hungry to serve in portable 2-in-1s, ultra-thin tablets, ultrabooks and other handheld devices. As one would expect, the Intel Core M (Broadwell-Y) series will be dual-core processors that feature Hyper-Threading (4 total threads), 2MB of cache per core, Intel HD Graphics (GT2 GPU), support for up to 8GB of low power dual-channel DDR3 memory and all the tweaks and improvements that come along with the move to the 14nm process. Intel hasn’t disclosed any specifics on clock speeds, performance numbers or pricing, but they did mention that the Intel Core M has 20% more execution units on the next generation graphics, so that means there are 24 EU’s on Intel Core M and there are plenty of rumors floating around online that Intel Core M will have a design power of 4.5 – 11.5 Watts. The move to 14nm means that Intel can provide a greater performance-per-watt at lower TDPs, which unlocks the door for thinner solutions (less than 9mm thick) and even fanless designs. 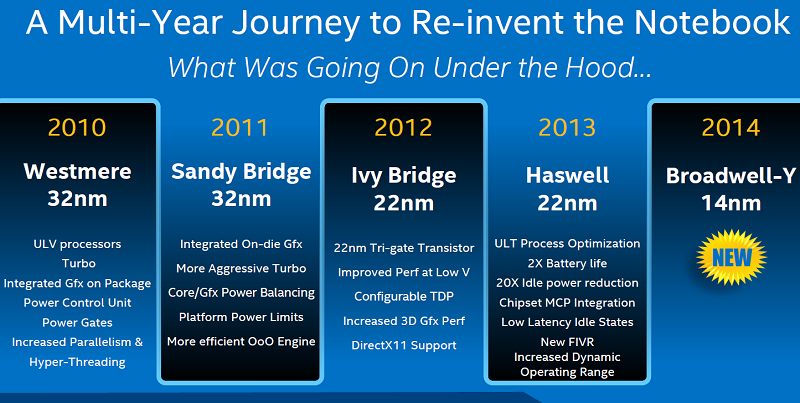 As you can see from the slide above Intel has made a slew of changes to the processor and just not one single thing. One of the demo machines that we were shown was a tablet called Llama Mountain. We weren’t allowed to take photographs for some reason, but Llama Mountain is a proof of concept tablet made by Intel to show off what the Intel Core M processor can do. The tablet was just 7.2mm (0.28-inch) thick, which is thinner than the Apple iPad Air that is 7.5mm in thickness! Intel claimed that the Windows 8.1 tablet would be able to outperform a basic Intel Core processor powered notebook that was 26mm thick from 4-years ago with tremendous savings in size, battery life and weight. Intel mentioned a 4x reduction in TDP, 7x graphics improvement, 2x improvement in IA core and half the battery size and double the battery life. The Llama Mountain reference design weighs just 1.47 pounds yet still can last up to 8 hours thanks to the 32Wh battery the housing hides. This specific tablet design will never come to market, but it shows that some really exciting tablets should be hitting the streets just before the 2014 Holiday shopping season gets into full swing. Intel’s Core M family will offer around a 20 to 40 percent performance improvement, greater than a 2x reduction reduction in TDP with better performance than the current Haswell-Y series. The Intel Core M has a 60 percent lower SOC idle power and that is key for the increased battery life and fanless design wins. One of the other key improvements that we will go into greater detail on the next page is the fact that the Broadwell-Y processor has a 50 percent smaller package size (XY) and is even 30 percent thinner than Haswell-Y. This means that the processor will take up much less space inside devices and that is one of the key enablers to the emergence of 9mm and thinner devices (not including the keyboard if one is needed). As Intel started building Broadwell they had the goal and vision to bring the promise of the full brand in a fanless solution. That was the vision and each engineer on the team was working to bring the power down considerably without giving up on the performance improvements that come with each new generation. If you have to summarize the Intel Core M processors at the highest level you can summarize it at three points. 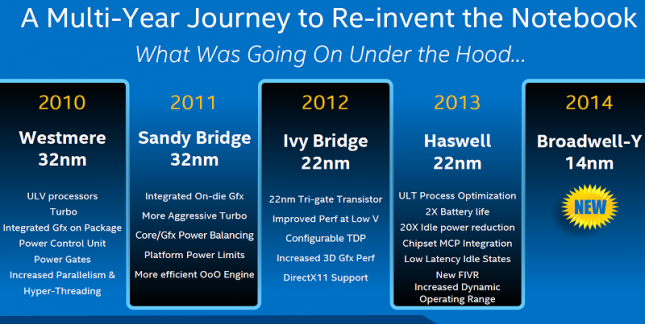 Let’s take a closer look at the 14nm process that is being used on Broadwell.